This time last year I reviewed the trends in social and collaborative technology in the project management space: some of my predictions had come to nothing and it was interesting to look backward and hold myself accountable for what I said would happen. 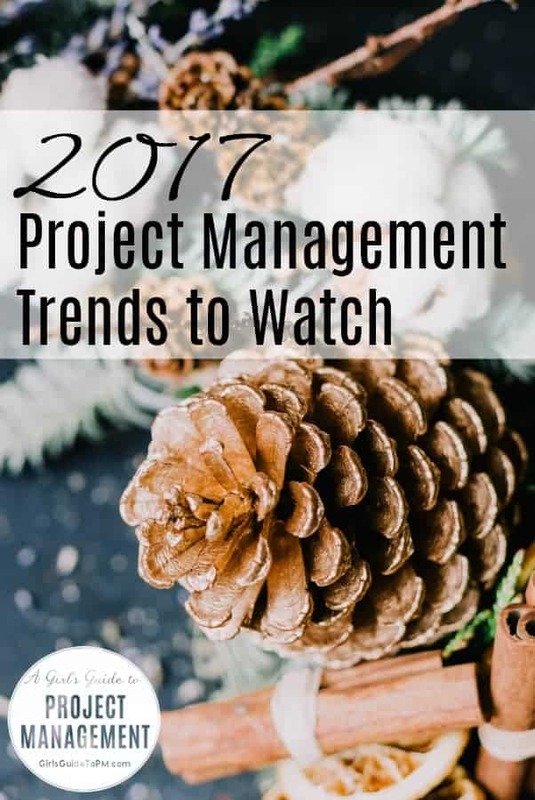 This year I’m looking forward into 2017 to highlight some of the project management trends I think it is worth watching out for. I think we’ll quickly see companies that don’t have professional methods for project management in place wanting to shift away from planning on the back of a postcard to taking more robust approaches to doing projects. We need this because project work is huge and complicated. It’s helped by the underpinning technology. Even the smallest firm (including my own company with all of two part-time employees) can use project management software. There are so many products to choose from that you can find one that scales right down for you, but still gives you a professional framework for getting your work done. The introduction of the apprenticeship levy in the UK next year may well have a significant impact on training budgets even in mid-sized firms. A positive benefit to this could be employers putting existing professionals through the Higher Project Management Apprenticeship scheme, upskilling them at virtually no cost (or at least, through funds already paid to the government in the form of the levy). The APM has already made huge inroads to gaining Chartered status for Project Managers. Will 2017 be the year we get our first Chartered Project Professionals? If you’ve come to one of my presentations about project management technology trends, you’ll have heard me say that big data is a game changer for projects. Our software tools are full of data from the risks we log to the estimates we fail to achieve. You can’t hold information in your head about how accurate each individual team member has been in estimating their workload on this project and the last five projects they have worked on. With big data processing capabilities, your software could sift through the estimates and actuals, and then flag the three team members with the worst record for getting their estimates right so that you can appropriately challenge them. Are you waterfall or Agile? Or something else? I think it matters less and less with each passing year. What matters is whether you can get the job done in a way that works for your business. If that’s a blended approach, and I’m seeing that more and more, then good for you. If pure Scrum works, or you’re totally a waterfall shop, then as long as you are seeing results no one is going to care. If project success rates are going to go up – and they really should – then value and business benefit are where we should be putting our energy. Not into what template you need to use or whether it’s a ‘risk log’ or a ‘risk register’. How long can we cruise on the coattails of project successes like London 2012? We’ve got major projects coming up in the UK like Crossrail 2, the Hinkley Point C power station and the restoration and renewal of the Palace of Westminster. We need to be focusing on learning the lessons from successful major industry projects like Terminal 5, making use of the learning legacy information that is available (Crossrail apparently has a public access learning legacy site now but I haven’t seen it yet). Even smaller projects can make use of the lessons learned on the biggest investments. I’ll be watching the Infrastructure Industry Innovation Platform to see what impact that has on project success (lots, I hope). Project management and change management have collided. To be a good project manager you need to be doing change management too. It’s no longer enough to turn in your deliverables and hope for the best. Even if you aren’t the person responsible for change management as a minimum you need to make sure that someone is doing it and track that progress in the project plan. Collaboration on projects has never been more important or more critical for success. As teams get larger, more widespread and flatter, as consumer and activist groups gain more traction, project professionals need to know how to engage stakeholders and bring people on the journey more than ever before. Project professionals need to know how to engage stakeholders and bring people on the journey. If I had to choose just one trend to follow next year, it would be collaboration. Fantastic things happen when people work together for a common goal. There’s nothing to stop you reaching out to your industry peers to get advice or to talk through a problem. That’s collaboration too. Be brave, find your people and have a wonderful 2017. 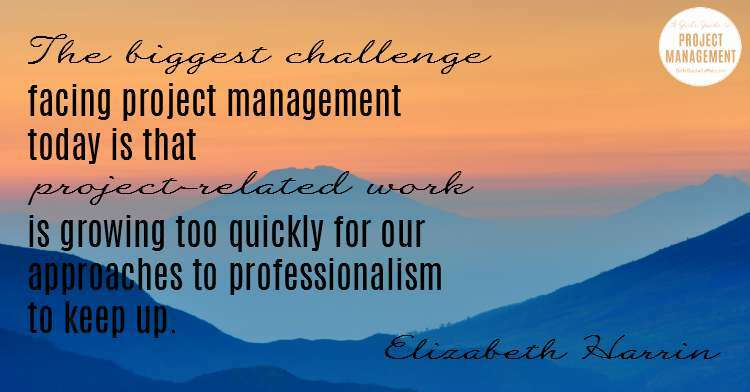 I can help you manage your projects more effectively. Join over 10,000 subscribers at GirlsGuideToPM.com. We'd love to have you! This really is an insightful piece, Elisabeth! I, as a change management professional, couldn’t agree more with the last point of yours. Change management (CM) and PM are indeed less and less separable these days and this really is a trend that will soon become a lot more apparent. In fact, I happen to work on a research project , which tries to better explore certain aspects of the interdisciplinary knowledge of CM and PM. Actually, it would be great if some of your readers would feel like contributing to our work , which would also be a great help with my PhD dissertation. Thanks for sharing your article! I agree with the collaboration, as well as the suggested Innovative or Divergent thinking, but I would also suggest increasing focus on environmental and/or social issues within the PM world. Perhaps both using both of the mentioned themes to find better solutions to address these challenges! Hello Karen, thanks for your comment! I covered ‘green’ project management in my 2015 trends here and I didn’t think about including them again. I should have done so, as I don’t think that we have made as much progress in this area as we should – sustainability and environmental and social awareness of the impact we make as project managers should definitely be on the radar. As more and more teams are spread across continents – Trump’s threats notwithstand 😛 – one of the major challenge for most project / program managers is to handle the cultural and time differences. I manage a team in China and India apart from folks in Europe and Singapore. It becomes very tough to convey the sense of urgency properly to everyone. So, along with traditional PMing, one needs to master the cultural communication challenges as well. Very true! Thanks for taking the time to leave a comment. I think global teams are fast becoming the norm even in places where they haven’t been recently, and we’ll only see more of this need for cultural communication integration. Great suggestion, Dana! This is definitely something I am seeing too – not just in PM but in all areas of management. Being able to draw together threads and not remain inside the box’ is certainly a skill worth cultivating. Thank you for sharing this article this very helps for project managers and Entrepreneur. Loved the article! Specially the Blended Methodology part! Project management trend has really evolved this year. One major change that I’ve seen is the increased usage of project management tools. From freelancers and small stores to mid-sized companies and the biggest brands, every type of business is taking advantage of such tools becoming better at management. Even I recently joined this trend and started using proofhub(recommended by a friend) and it’s been helping me a lot with handling me my team and work!